Most babies naturally take to water very quickly, but that doesn’t stop both parent and child being nervous when it comes to the first dip, be it in the sea or a swimming pool. However, our Baby Wrap Warmer will make introducing your baby to water a dream. The simple, flat lay design makes it super easy to get your little ones ready – as easy as laying the suit down on a flat surface and wrapping your baby securely in it. This simplicity will inevitably minimise the stress, allowing your little one’s natural instincts to kick in and let them take to the water even quicker. Our baby wrap’s 100% neoprene material is super soft, ensuring that your baby feels comfortable, and provide you with the reassurance that comes with using a tried and tested wetsuit material. This means you can have complete confidence in how warm your baby will be, as well as the suit’s quality and durability. Velcro fastenings ensure that your baby will be safe and secure, but the suit can also be removed quickly if necessary. Our baby wraps also feature flexible flat stitch seams, ensuring optimum comfort. This easy and comfy design means that you and your baby can focus on the joy of swimming, rather than what you’re wearing. 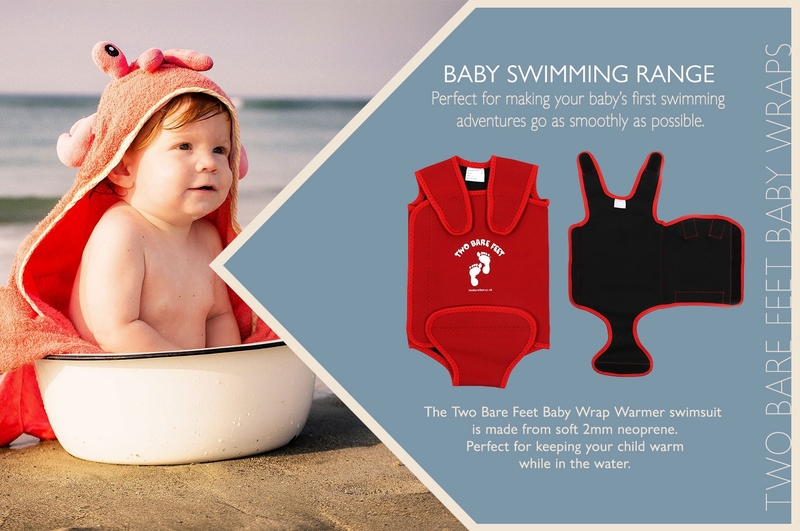 Neoprene is incredibly fast drying, so your baby will stay warm while in and out of the water. Dry in no time and ready for the next dip, the baby wrap is perfect for your first family trips to the beach. The thick material used in the wrap also offers UV protection, taking another seaside worry off your minds. Ranging from sizes for new-born babies, all the way up to two-year-old toddlers, our wrap warmer is the perfect suit for your baby to wear during their first water experiences, be it in the swimming pool or the sea.